The terrible details of the tragedy of Jewry in the northern part of Transylvania, which had been annexed to Hungary after 1940, emerged even in the last months of the Second World War, when the essence and events of the genocide were known in ever wider circles. As awareness of the events first emerged, literary and artistic works were also published in Transylvania between 1945 and 1949 that depicted the cruelties of the Shoah and at the same time aimed to raise a lasting monument for the Jewish communities that had been destroyed. 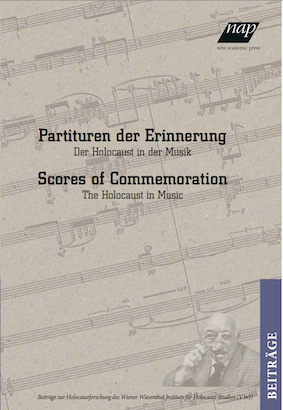 These early works of Holocaust remembrance made a considerable contribution to retaining the mass murder in people's consciousness and turning a young generation's awareness to the terrible heritage of Nazism later on, when, during the decades of consolidation of communism, all spheres of life were submerged in a “great silence”. In 1992, the government of the Federal Republic of Germany decided to dedicate a memorial to the victims of the genocide of Sinti and Roma. The Memorial for the Sinti and Roma of Europe murdered under National Socialism by the artist Dani Karavan was inaugurated in October 2012 in the centre of Berlin, near the former Reichstag building. The planning and construction phase spanned two decades, during which many discussions addressed the significance awarded to the Nazi persecution of “gypsies” next to the Holocaust. These discussions reached an apex in a controversy enacted via media between Yehuda Bauer (then the director of the International School for Holocaust Studies in Yad Vashem) and Romani Rose (the head of the Central Council of German Sinti and Roma). 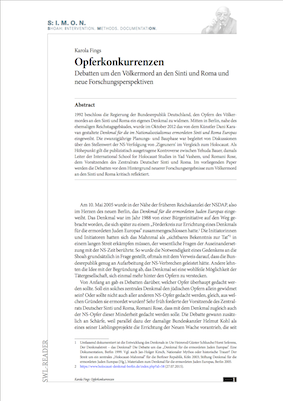 This paper critically reflects the debates in light of new research results on the genocide of Sinti and Roma. This text is the penultimate chapter of Zoltán Halasi's book Út az üres éghez (Road to an Empty Sky). With this work, which was first published in Hungarian, the author created a singular memorial to Polish-Jewish culture and its destruction. Setting out from the Yiddish Holocaust poem Dos lid funm ojsgehargetn jidischen folk by Itzhak Katzenelson, Halasi records what was lost in the Shoah in the course of nineteen compelling chapters. He takes on the grab of an art historian, a literary critic and a travel guide when he reports about a wooden synagogue and the Jewish quarter in Warsaw. In the role of a German banker, he illuminates the aims of the Nazi monetary policies, as a writer of SS brochures he highlights the absurdity of racism. Depicting a Selektion in the Warsaw ghetto, he shows the grim logic of compulsive acts in catastrophic situations, draws an image of the running of the extermination camp Treblinka. The cynical words of two German policemen provide an insight into the rituals of mass executions and introduce us to the craft of murder. 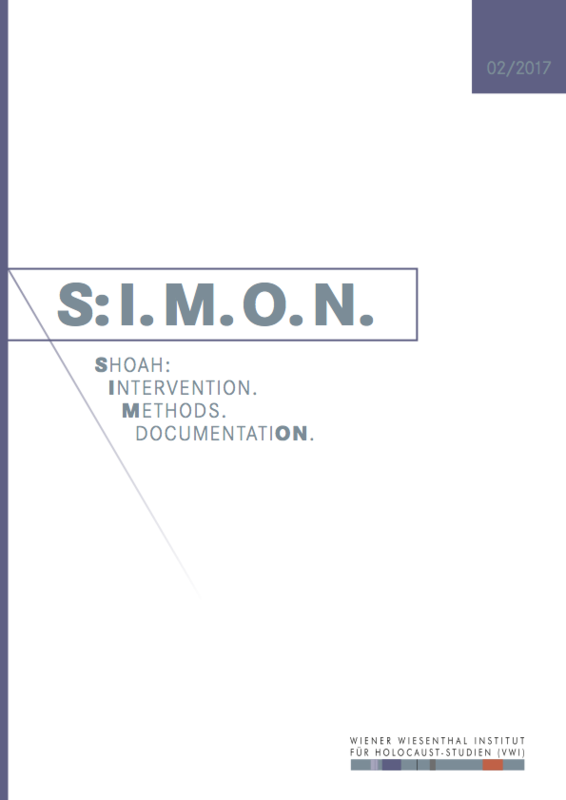 The final chapter is an interplay of slithers of narrative by Jewish children on the run and by those who helped and hid them that borders on the unbearable. The chapter reproduced on the following pages has three parts: Part one is a Treblinka railway station master's report to the Polish Home Army. 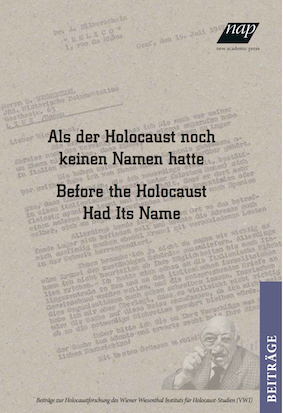 In the second part, a former Jewish detainee who managed to escape from the extermination camp Treblinka gives a literary treatment of his arrival at the camp. The final part consists of an inner monologue by the Treblinka extermination camp's director of administration. 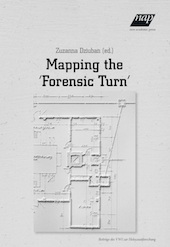 The book will shortly be published in Polish at the Nisza publishing company in Warsaw. 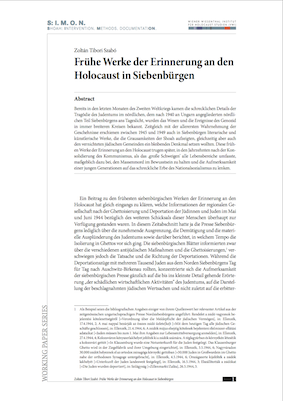 The German-speaking public was first presented with the work on December 1, 2015 at the Simon Wiesenthal Conference 2015. 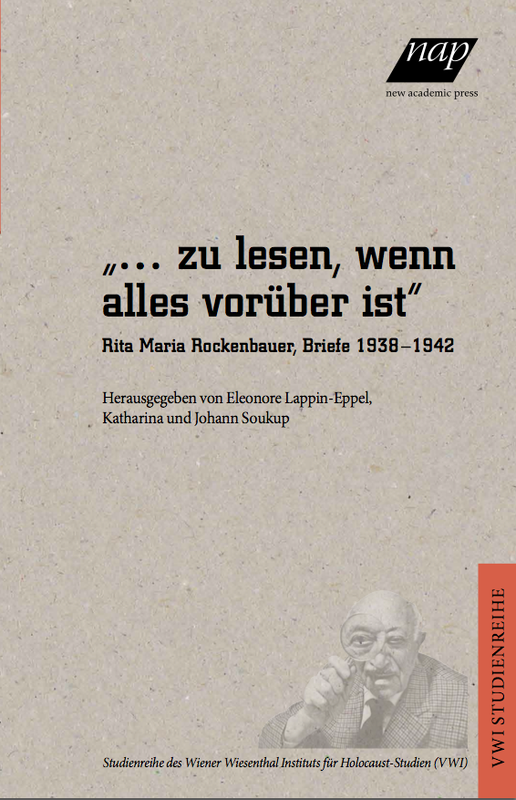 The German translation by Éva Zádor and Heinrich Eisterer is in progress. 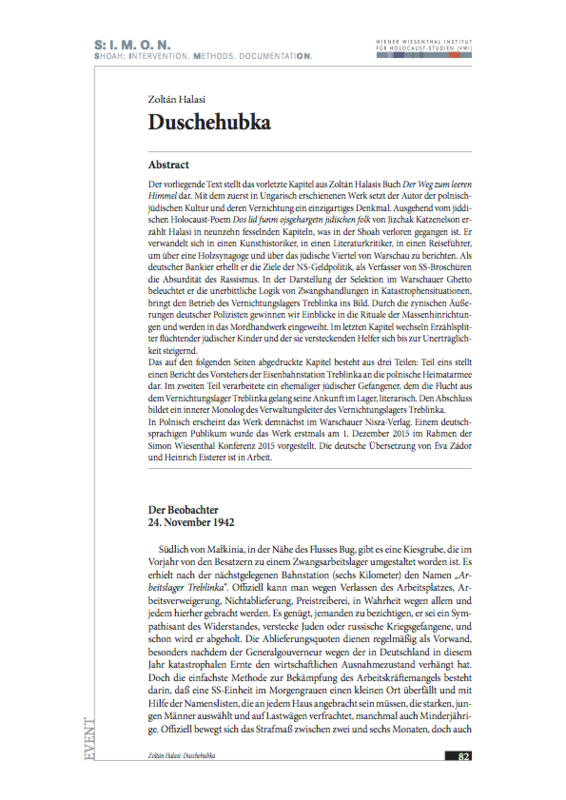 Download PDFOlder Research either hardly paid any attention to Slovak antisemitism in the First Czechoslovak Republic (1918–1938) or regarded as a kind of preliminary stage to the Holocaust. 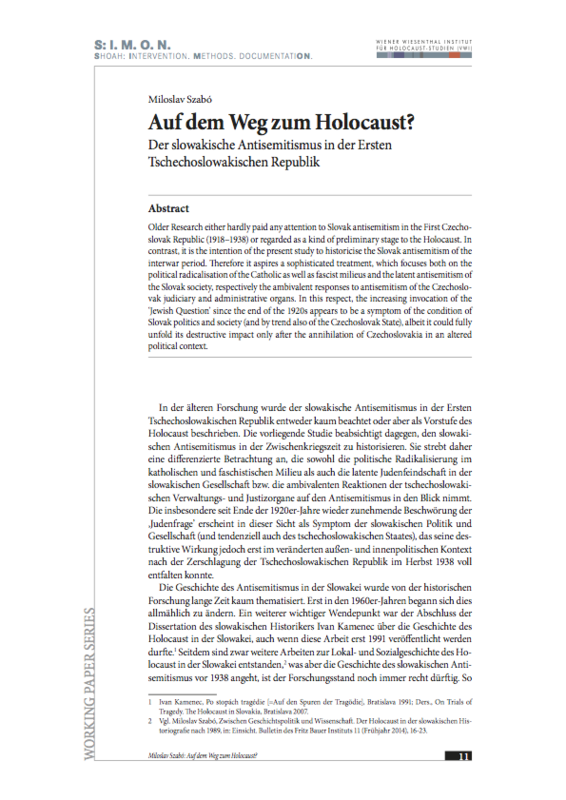 In contrast, it is the intention of the present study to historicise the Slovak antisemitism of the interwar period. 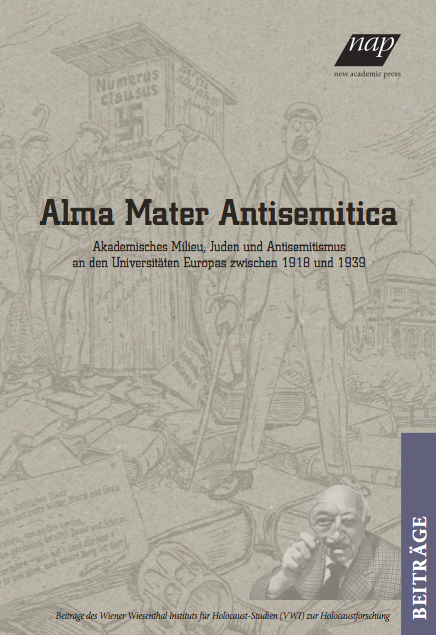 Therefore it aspires a sophisticated treatment, which focuses both on the political radicalisation of the Catholic as well as fascist milieus and the latent antisemitism of the Slovak society, respectively the ambivalent responses to antisemitism of the Czechoslovak judiciary and administrative organs. In this respect, the increasing invocation of the 'Jewish Question' since the end of the 1920s appears to be a symptom of the condition of Slovak politics and society (and by trend also of the Czechoslovak State), albeit it could fully unfold its destructive impact only after the annihilation of Czechoslovakia in an altered political context.